Limited Edition bobblehead commemorating the Brewers remarkable 2018 season and signature celebration is now available for pre-order exclusively from the National Bobblehead HOF and Museum. MILWAUKEE, Wi., March 27, 2019 – This morning, the National Bobblehead Hall of Fame and Museum unveiled an officially licensed, limited-edition bobblehead commemorating the Milwaukee Brewers’ remarkable 2018 season. 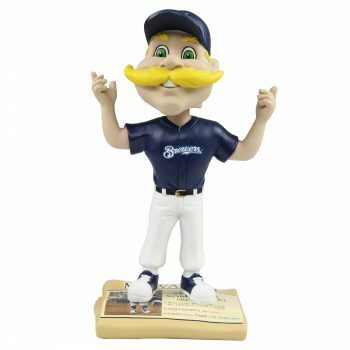 The bobblehead features Milwaukee Brewers mascot, Bernie Brewer, doing the team's signature "Show Us Some Love" celebration, which followed the team’s big plays throughout the 2018 season. This is the only bobblehead incorporating the Brewers’ celebration. The limited edition bobbleheads, which are individually numbered to only 1,000, are expected to ship in May and are available for pre-order beginning today at the Hall of Fame and Museum’s Online Store or at the Museum, which is located at 170 S. 1st St. in Milwaukee’s Walker’s Point neighborhood. The bobbleheads are $40 each with a flat rate shipping charge of $8 per order and were produced exclusively for the National Bobblehead Hall of Fame and Museum by FOCO. As an Opening Day Special, fans who order by Sunday night will also receive one free admission ticket to the National Bobblehead Hall of Fame and Museum for each bobblehead purchased. The Brewers 2018 season accomplishments are highlighted on the bobblehead’s newspaper-shaped base, which also features a picture of Bernie celebrating. Those accomplishments include the National League Central Division Championship, a NLDS series sweep and coming within one win of the World Series. The celebration was started by Brewers outfielder Lorenzo Cain, who started doing it while with the Kansas City Royals several years ago. Cain broke out the celebration during the Brewers 2018 season-opening series sweep of the Padres where he reached base in nine of his 15 plate appearances. The celebration quickly caught on and carried all the way through the Brewers postseason run. The National Bobblehead Hall of Fame and Museum, which is located at 170 S. 1st. St. in Milwaukee, Wisconsin, opened to the public on February 1st, 2019. The HOF and Museum also produces high quality, customized bobbleheads for retail sales, organizations, individuals and teams across the country. Visit us at www.BobbleheadHall.com, www.facebook.com/BobbleheadHall or www.twitter.com/BobbleheadHall.